Your lines should be dry, neatly coiled, and kept out of the sun when not in use. You’ll find the life and integrity of the lines will be extended greatly if you take care of them. Nylon line is best for tying up to a pier, because it has enough stretch to lessen the shock to your cleats when the boat jolts to a taut line. Twisted line is better than braided line for this purpose, for the same reason. Read more. 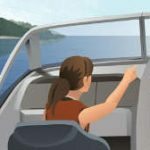 A good boater approaches a dock or slip at clutch speed and in full control, regardless of wind or current conditions. Running up to a pier at half throttle, and slamming the engine in reverse to stop is a sign of poor boat handling skills. All maneuvers in and around other boats, piers, and docks should be done slowly and skillfully. In addition to appropriate mooring lines and anchor rode, carry a polyethylene or polypropylene heaving line on board. This material floats, and is a welcome sight to anyone in the water. My favorite color is blaze orange or yellow, which can be seen easily by someone at eye level to the water. And, it’s less likely to get entangled in the prop. Of course, if you’re retrieving someone over the stern or anywhere near the boat, the prop should not be turning anyway. Never tie up to buoys or other navigation aids. It’s dangerous, and it’s illegal. 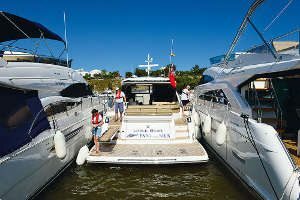 When boarding a small boat, keep low and step toward the middle of the boat. Hand ice chests, beverages, or other supplies to someone in the boat before boarding, or set them inside the boat. Secure all fenders inboard when leaving pier or dock facility. Nothing will make you look more like an inexperienced boater (I put it delicately) than to run your boat across the water with your fenders flopping outboard. Before you approach a pier, make certain that everybody on board knows what they’re supposed to do. If it’s just sit still and stay out of the way, tell them that. I can think of nothing more risky to fingers, hands, arms, and even heads than to have everybody in the boat reaching overboard to grab ahold of the pier or a piling to “help you out”. Please read our Terms & Conditions below carefully before accessing or using our website. By accessing or using any part of the site, you agree to be bound by these Terms of Service.